When I started out this storyline, it seemed clear that the outflow of vacuum from dark matter must lead to expansion of space. Dark matter causes the expansion of the universe - as observed from our point of view - but they, performing a likewise reasoning from their point of view, they blame us for it. So, who did it? View has elaborated since, but the title is still nice, isn't it? As is concluded in item 13 of page 1 of this storyline, there are no forward and backward time superpositions in one and the same vacuum. The anti-atoms might have a tight fitting “bubble” of backward time vacuum around their constituting particles. They were not present 1000 seconds before their creation (allowing us not to perform the experiment). So, as observed by them, they were spontaneously created at the loose spots they went at the end (our end) of the 1000 seconds, to end (their end) their lifetimes all together in the anti atom creation machine. This sounds very unlikely. So CERN’s antimatter atoms are normally forward time evolving. A large cloud of molecules starts to contract under the force of gravity, heats up, radiates the heat to the outside, and then continues contracting. If not for nuclear reactions starting, creating stars, this would just go on until the Schwarzschild radius was passed. Anyway, reality shows there are stars. A large cloud of stars usually keep circling each other, as in globular star clusters and spiral galaxies. Those star systems don’t contract any further. In general, gravitation leads to contraction and generally a contraction comes to a halt. Classical view states expansion of the universe is counteracted by attracting gravity of all matter in it that might stop it and reverse to contraction. Or might slow down to a standstill after an infinite of time. Or keep on expanding for ever. In this site forward time evolving matter (our kind of matter) is called bright matter. Then dark matter is backward time evolving antimatter. Their past is our future and vice versa. Consider a number of bright galaxies and an equal number of dark galaxies. To meet more realistic conditions, we suppose the bright galaxies to be concentrated in nodes (point-like features), filaments (line segments) and planes. 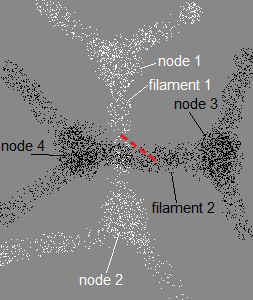 The filaments connect the nodes and span the planes. The planes together envelop voids. The black galaxies are concentrated likewise, but their nodes are in the middle of our voids. The dark filaments, from black node to black node, cross the white planes. Consider two dumbbells of galaxies, one bright (depicted white, each dot a galaxy) and one dark (depicted black, each dot an antimatter galaxy), that happen to be of same mass and same volume and shape, same mass distribution. Their filaments are perpendicular to each other, but one “above” the other - the red dotted line that connects the centers of the dumbbell shapes structures is perpendicular to both filaments. Other filaments are present but are neglected. Compare item 15 at page 1 of this storyline and page 6 of FORWARD BACKWARD TIME DIRECTION. The result should be forward vacuum in the bright filament, backward vacuum in the dark filament and somewhere between them is the time border. Our galaxies attract each other. So do theirs, but their attractional influence, when passing the time border, becomes a repulsive force to us when in our forward vacuum. According to paragraphs Dark and bright planets and stars of equal mass and (the end of) The gravitational field and the expansional field, both at previous page, the dumbbells exert no gravitational force on each other. If the universe in this way consists of rods-and-nodes in equal amounts bright and dark, then the universe tends to be static. 1) The dumbbells are no rigid structures. Do the black and white dumbbells maintain shape or will they distort each other? 2) Star systems are observed colliding, but even then actual star collisions are rare. Consider a bright and a dark galaxy colliding. All stars of about equal but opposite mass would hardly notice each others passage. We might see only some annihilation effects, especially from matter-antimatter clouds colliding. The dark stars we don't see. When a matter and an antimatter star actually collide, then follows a matter-antimatter explosion. Is this true, would a dark and a bright galaxy of about equal mass go through each other without noticing? We need a good simulation program. In the outer rims of the galaxies the stars move too fast to be kept inside. A gravitating dark halo was supposed there, keeping those stars within. Recently is suggested that when galaxies formed, the central black hole might have ejected jets of some kind of heavy particles, in both directions perpendicular to the galaxy disc. When the particles have huge mass and had not too huge initial velocity, the jet particles are expected to fall back to the disc these days. The gravitational effects of the opposite jets cancel out at the galaxy center, but at the galaxy rims a net force towards the center remains. In galaxy clusters the individual galaxies move too fast too. Dark matter is supposed to be present in the cluster to keep the cluster together. There is supposed to be about six times more dark matter than radiating matter, all in all. Seven parts, six of them are dark. 5 * 10^9 years ago dark energy's push was equal to dark matter's pull. At that moment the universe was expanding and from then on the universe was bound to an accelerated expansion. In this site BLACK AND WHITE GLUEBALLS are a concept from colors as quaternions, extensively treated in the QQD storyline. 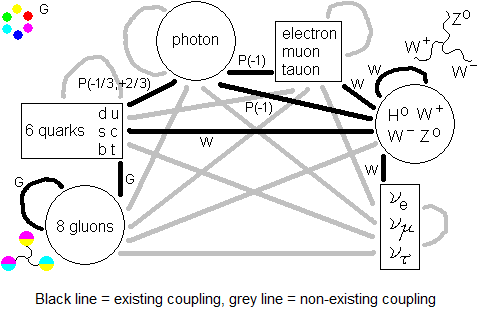 And see also Fig 3.9 and subsequent explanation in paragraph Other colorshifts and mesons at page 3 of NETFORCES IN QCD. QQD is meant as the quaternion successor of QCD. Black and white glueballs might have been created in large numbers when density is high and energy is abundant, at the beginning of the universe and at black holes. Black glueballs have mass and white glueballs move at lightspeed. Once created, the white and black glueball seems stable. And when temperature dropped and matter became sparse they had little way to dissolve. We can expect white glueballs or black glueballs to form glu2ons (see GluNons at page 7 of the NET FORCES IN QCD storyline). This would be common when matter is dense and energy is abundant. The formed white pairs will be vacuum pairs and will be absorbed by the vacuum, enlarging it by their volume. It would cause then a kind of inflation in our forward time part of the universe, an uncontrolled growth of the vacuum, as long as matter density and energy is sufficient. Below that threshold the forming of white or black gluon pairs would stop automatically. The black pairs will be absorbed by the backward time evolving vacuum when they happen to cross it, causing it to shrink as observed by us. In the beginning of the universe - their end of the universe - the backward vacuum is observed by us as undergoing a time reversed inflation. The black-and-white pairs are yet to be considered. Is the black glueball a candidate for DARK MATTER? Backward time evolving dark antimatter is a candidate for DARK ENERGY, as is described in previous page. Is the white glueball pair a candidate for the INFLATION at the beginning of the universe? If so, because of the inflation, the backward time evolving parts of the universe might be further away from us than originally is thought. What exactly happens is yet under consideration. I tried to treat the emission and absorption of white gluon pairs in A real vacuum particle in the vacuum at page 4 of QG, Quaternion Gravitation. When the primordial universe consisted of a homogeneous mix of matter and antimatter and in roughly equal amounts, then the matter seems not to have influenced the antimatter at the beginning of the universe by gravitational force (equal mass and antimass exert no force on each other). Matter parts alone will tend to contract under gravitation, antimatter parts likewise ditto as observed from their point of view, and after time the contractions will come to a halt. In matter entropy increases. In antimatter the entropy decreases, as observed from our point of view. Antimatter processes in backward vacuum will induce anti-entropic behavior in the matter processes it has contact with, and vice versa. At the beginning of the universe, when taken over the several forward and backward areas, time will tend to elapse backward and forward in equal amounts, resulting in no net elapse of time. As far as gravity is concerned the beginning of the universe might have been big, but certainly not a bang. But gravitation is not the only force. When matter and antimatter come together that dense as is assumed at the beginning of the universe, the particles and antiparticles will annihilate each other. The entire mass in the universe well mixed with the entire anti-mass in the universe will explode as one single gigantic nuclear bomb. Yes, that gives a bang. It explains why the beginning of the universe was hot. The expansion of universe might be sufficiently explained then. But the accelerated expansion is not. Unless there is a little excess of antimatter in the universe, see item 15 of page 1 of THE EXPANSION OF THE UNIVERSE. Then there is a net amount of Higgs marble emission in the universe not counteracted by Higgs marble absorption. In spite of phenomena like “rearranging of vacuum marbles” and “erasing of velocity”, as observed by us there is created more space than space disappears in the act of gravity. The antimatter galaxy surplus causes an extra recession added to the already present expansion of the Big Bang. In precisely the same way as we did in page 4 of NEWTON EINSTEIN KIEKENS GRAVITATION also the series of recessions of antigravity are indistinguishable from a velocity. One should realize the recessions are just ordinary gravitation in their own frame of reference. In gravitation is concluded the acquired velocity (take in mind a particle that has this velocity) is maintained and so we do here too. The acquired velocity then can be put in a box. The next pulse of Higgs marble emissions causes another recession, that adds a velocity to the box (that already has a velocity inside) that is maintained, and so on. This is an acceleration of the content of the box. Is this a candidate for the observed acceleration of the expansion of the universe? If we see the universe to expand - an ordinary constant expansion, mainly electromagnetically driven from the Big Bang - then they observe the same universe as shrinking. Added to this we see an excess of vacuum particle creation, an accelerated enlarging of space between them and us, caused by the backward gravity of the excess of antimatter. They see an excess of vacuum particle disappearance added to their shrinking, an accelerated reduction of space due to the gravitational fields of their excess of matter (as they observe it) over antimatter. We see an accelerated expanding universe, they see an accelerated shrinking space. When forward and backward galaxies would repel each other. For gravitation I considered the law that matter attract each other, antimatter attract each other, but matter and antimatter repel each other. (Let's call it a-r-a, from attracting-repelling-attracting). Is then an asymmetry in time building up? Assume a collection of 2n galaxies, n bright, n dark, in a well-mixed distribution (not the node-filament structure we described above). We know the n bright galaxies all attract each other, when embedded in forward vacuum alone. The n dark galaxies also show attracting behavior to each other: in their own frame they certainly do and in the film of events played backward, as we observe them, the dark galaxies still will orbit each other. When forward and backward galaxies would repel each other then a reasoning similar to page 1 of the storyline SHORT-RANGE ELECTRIC NETFORCE IN NEUTRAL CHARGE DISTRIBUTIONS yields a surplus of n repulsions between the galaxies, making the universe to expand. And this is no longer time symmetric. Imagine in the well-mixed 2n galaxy distribution initially all galaxies are standing still relative to each other. Then the net repulsion gives the first pulse to expand. What is an expansion to us, will be a contraction to them. Well, what is a transition from standstill to movement (an acceleration) is a transition from movement to standstill for them. Which embodies a repulsion. So no, there is no direct time asymmetry apparent. Or is it? The a-r-a law itself is invariant under time reversal, see item 1) at page 1 of storyline FORWARD BACKWARD TIME DIRECTION. But when the 2n galaxies start from standstill with respect to each other, then the first moment thereafter the net repulsion has to be set in motion. But in what time direction? It must be that in the forward time evolving parts of the universe (that's us) the repulsion sets in motion, while we see in the backward evolving parts a shrinkage has set in motion. While they consider it precisely the same but the other way around. They are the ones expanding while they see us contracting. This is demanding to our imagination. In this site we don't go further on this way. As argued, a dark and a bright galaxy do not repel each other by gravitation. One should stop thinking in terms of attraction and repulsion. Dark galaxies cause space to grow, bright galaxies cause space to shrink. In symmetric mass distributions this tends to simulate neutrality - no force working. And IF one structure tends to dominate by larger mass then it forces the other structure to obey to a larger extend the mechanics of the dominant one (see paragraph Dark and bright planets and stars of equal mass at previous page). A net attraction is expected between the dark and bright systems, in principle leading to a contraction of the whole (but much weaker than with forward dynamics alone, working on the same mass distribution of only masses, no antimatter). That is, the dominant one will observe the contraction, the other will observe it as an expansion. But mind, all contraction will come to a halt. In a sense it is a pity matter and antimatter do not repel each other by gravity. If they would, then the dark galaxy cluster structures and bright galaxy structures would be kept apart firmly and I have serious doubts whether ever a representative of the human race will make it that far. But it would destroy the picture of the photon and the gluon consisting of a matter particle and an antimatter particle so close together they are within each others time borders and so become massless. No, we don't go any further on that way. Next page treats some properties of accelerated expanding space in a more traditional way, without further discussion on time-reversed dark antimatter. When ALL of matter attracts each other under the force of gravity (neglecting all dark antimatter), and when all galaxies are orbiting each other as the stars do in a globular star cluster, then the universe could be stable under gravity alone, isn’t it? Not an expansion, which is an orderly arrangement of impulses, but an unorderly arrangement of the same impulses. When disordered motion, as in globular star clusters, is transformed into an ordered expansion by translocating stars, keeping their impulse vector directions and magnitudes the same, the result looks like a fireworks expansion. See next page up to and including paragraph “The globular cluster”. In the course of the development of these ideas I fantasied what if matter and antimatter would repel each other. Let’s suppose the galaxy I set for, exerts a repelling gravitational force on me and my ship that I have to overcome. First the repulsion of the galaxy, then the repulsion of the star and finally the repulsion of the planet I planned to land on. I cannot go in orbit, the planet would force me in a hyperbolic path. I have to approach it nose down and engines on until the surface and as soon as the engines stop, the ship will be pushed away from the planet. I cannot land, I cannot walk there, unless I secure me onto the surface with climbing tools. Which is not possible: the matter of my pin would annihilate with the antimatter of the dark rock I wanted to hammer it in.